Prepare for the Visual Feast! 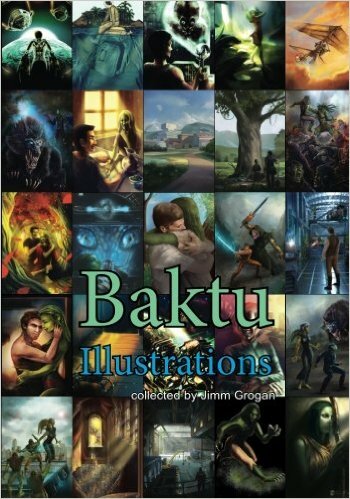 Baktu Illustrations Newly Released as FULL COLOR Special Edition! Happily, there is even more great news to share about Baktu! Cass here at the blog helm again, checking to inform you of the latest developments about the printing of the book and distribution on Amazon. As those who purchased early copies of book two in the Tomek series will know, the novel contains beautiful illustrations from contest winning artists, sourced from around the world. As he shared the novel with others Jimm learned personally of Baktu collaborators and fans of the written word who wanted to badly to see the original versions, that he pulled the trigger on an accompanying printed graphic which is just now available to the public, also on Amazon. Due to the cost of full color publication of the entire epic, the artwork had to be printed in black and white throughout. As you experience the image in only the form of light and shadow, it gives the drawings within the full length novel a nostalgic and dream like quality. Each visual likeness leaves your imagination to explore and envision the colors, hues, and contrast of every depicted scene. This difficult choice to remove color from the pages was done with the purpose to make the book more economically priced and therefore accessible to more readers. After seeing full novel in print, Jimm knew he wasn’t quite done sharing the diversity of talented artists who had contributed to the novel. It then also became of high importance to Jimm, as he progressed through the project, that the audience be given the opportunity to enjoy the full beauty of the different graphic styles of the artwork in high resolution full color. Personally, it is such a treat to see both the black and white, as well as the full color side by side as I read the novel again. Sometimes my imagination closely matched the artist’s rendering, and other times I was delighted to see that the artist had chosen nearly the opposite colors to what sprang from my imagination. In the full novel your imagination really makes the drawings your own as your mind’s eye fills in the details between light and dark – whereas the stunning high-resolution drawings provide every detail and some surprises as to the artist’s interpretation of the story. The full novel and the special edition collection of color illustrations are complimentary books, and make a beautiful set for avid readers and science fiction fans of all ages! In this newest release of the drawings accompanied by a short blurb about each artist, you may find yourself lost in the soulful pictures, and dreaming up the prequel as well as back story for Wra, Spri, and the other natives of Baktu. After you’ve enjoyed them both, please feel free to leave your comments or questions for the author about both the story and illustrations here! I’ll be back with you to share the next developments for the Tomek series! Thank you again to all the fans for your support and interest. Your continued curiosity and compliments have been a joy for everyone who contributed to the project, and especially for those artists who thanks to Jimm are able to bring the adventures of Tomek to both the digital and print world in black and white and brilliant color! Thank you! Amazon Approved Baktu to Move Forward – Includes First Sneak Peek For Readers! 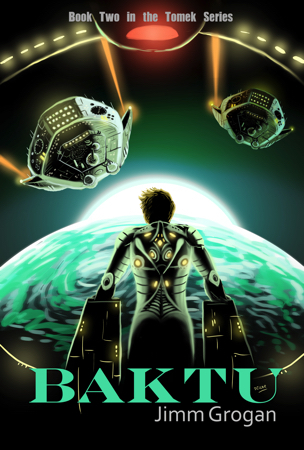 Baktu, the second science fiction novella in the Tomek series. Great news fans! You’re invited to a private sneak peek of Baktu hosted by Amazon Kindle! Hi Everyone! Cass here again, guest blogger, with the pleasure of sharing the first official flames of attention for Baktu! As you know Jim’s book is complete, has now also gone through the sometimes complex editing process, and as the publishing date approaches, more and more good news for fans of the series keeps coming out! Just this week Baktu was awarded admittance into Amazon’s Kindle Scout competition for unpublished manuscripts. You the reader directly benefit in this unique competition, because as part of the program, Amazon allows you to check out the first few chapters and nominate Baktu for publishing through the competition, for free. As well as another benefit after the competition concludes. Starting today you will have a full month to check out Baktu’s opening section, nominate it for publishing, and share it with anyone – for free! After that, and with the most nominations in this competition group, their program additionally rewards those readers who nominated Baktu by providing each of you a complimentary Kindle eBook edition of the entire book to keep! Please do support the continuation of this fun sci-fi series by enjoying Amazon’s advance preview and offering Baktu your publication nomination after you have taken pleasure in the exhilarating opening scenes and developing story! When Baktu moved onto the next stage your participation at this early stage guarantees you a complimentary copy of the full novel as soon as it’s released by Amazon! The anticipation of Tomek’s landing, at the outset of Baktu, and escape from the dangerous powers in the previous novel, Negative Zero, are only the first mysteries revealed to readers who take advantage of Amazon Kindle’s sneak peak. You will soon be lost in this fascinating world that is both totally alien and not all that much unlike our own world. If only we had the intergalactic travel, Baktu would definitely be a must see destination. It has been noted that along with the book’s cover, a large part of Tomek’s journey includes the mysterious illustrations always intended for inclusions the final print publication. Amazon’s Scout competition, however, only allows for the novel’s cover and text to be reviewed and nominated. But, we are glad to report that after winning, when published and sent by Amazon to all those who nominated it, we can confirm that Baktu’s eBook will definitely include the full set of color illustrations! This is a really great opportunity and deeply appreciated honor for Baktu to have met their standards for publication and to have gained immediate admittance into the active competition. We invite you to please visit Baktu on Amazon’s contest page, enjoy the sneak peek, and give Baktu your nomination! Please do also share the experience of your reading it with everyone you know and also with Jim directly here on the site! Negative Zero is an action-packed space opera that will appeal to lovers of mysteries, crime novels, and conspiracy theories. In a distant future when an evolved human race coexists with fantastical creatures, infamous vigilante Negative Zero brings criminals to justice. In classic science-fiction style, Jimm Grogan has created an action-packed world with innovative characters, interplanetary intrigue, and diabolical schemes that threaten the future of the Azten Empire of Federated Worlds. With illustrations by Duncan Long, Negative Zerocaptures the spirit of the righteous avenger. Tomek Nois Plantona Regalia 1294 2 is a man of many talents. He divides his time between his day job as a spacecraft engineer and his hobby of tracking down dangerous criminals as a vigilante assassin. Using disguises that are unique down to facial features and mannerisms, Tomek feels secure in his anonymity until his involvement in two deadly cases leads to the unmasking of his alter ego, Negative Zero. The book opens with a suspenseful action sequence involving the takedown of a criminal who feeds human flesh to her exotic, hypnotizing birds. While the book is largely plot-driven, Grogan does include some backstory on Tomek’s transformation into Negative Zero, a change shaped in large part by the tragic, unsolved murders of his mother and father. The dangerous cases that Tomek takes on, including a government conspiracy that has cost thousands of lives on the planet Zimvia, all seem to interconnect with clues that could unlock the secrets of the past. Grogan has neatly set up Negative Zero for a sequel or series. A smattering of grammar and punctuation errors exists, including an occasional dropped article and extra spacing between words; these minor details are easy to dismiss thanks to the fast pacing and page-turning suspense. An illustrated appendix of races provides a convenient reference point for the six major species mentioned in Negative Zero, although Grogan does specify that the “Azten empire is home to citizens of about twenty different races. However there are significant populations of only about seven of them.” Duncan Long’s drawings complement the text, outlining complex social customs and appearances of each, whether they be human, orwallin, zimvi, or navino. Although Negative Zero, with its futuristic technology and civilization, is pure science fiction, it will also appeal to lovers of mysteries, crime novels, conspiracy theories, action-adventures, or any genre wherein good overcomes evil. Attached is one of three beginnings to my Negative Zero novel, before we settled on the hypnotic birds. This candidate that was later rejected told the story of young Tomek as a child, and introduced the death of his parents, a mystery that will arc through the series of all three planned books. However there was a worry the the time discontinuity between chapter 1 and chapter 2 would disorient readers. I still told Tomek’s childhood story in the novel, but as a series of flashbacks sprinkled throughout. The prologue here, setting up some indirect clues about why his parents were killed, never did get published. By starting with the current chapter 1, we showed an introduction to what normalcy was for Tomek, before he got entangled in the complicated Cane-Lua plague mess that took over the plot. We thought the current chapter 1 would serve as a better hook, and help establish the base venue and situation to build on going forward.